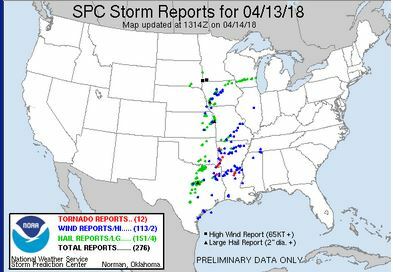 Follow up from yesterday: 12 tornadoes, and many hail and wind reports were made yesterday. 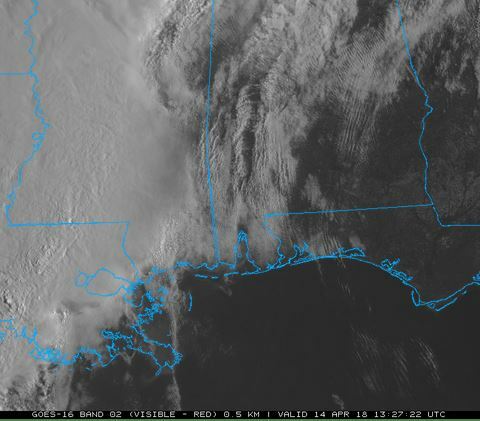 The tornadoes clustered around the I-30 corridor in Arkansas, and to the south in Louisiana. Associated with the Moderate Risk is a 10% Tornado Threat Ring. Synoptically speaking, the 250 mb NAM chart shows a deep trough moving east through Dixie Alley. 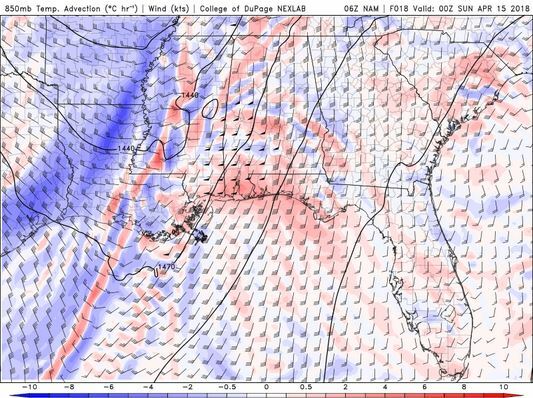 The 500 mb NAM chart shows strong Positive Vorticity Advection (PVA) moving through Mississippi by 21 Z. 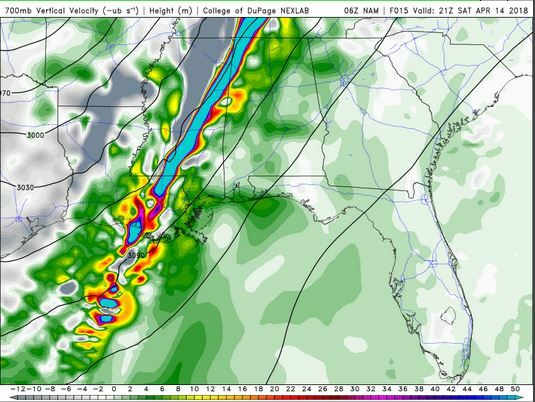 The 700 mb NAM chart shows a line of rapidly-rising air ahead of the cold front as it moves through Mississippi. The 850 mb NAM chart Cold Air Advection (CAA) as a cold front moving through the south by this afternoon. 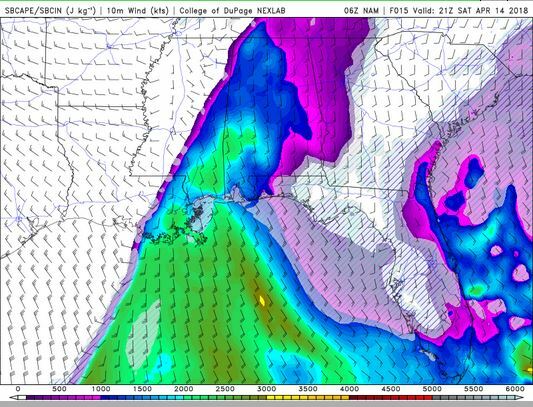 The surface dewpoints (NAM) show a sharp dryline running through Mississippi by 21 Z.
CAPE will not be high, but it may be adequate, given the deep moisture and strong shear. 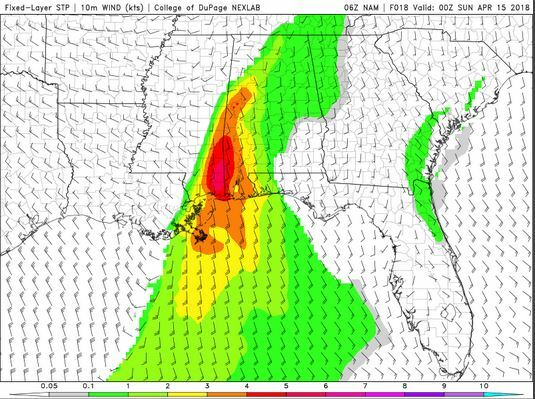 The NAM shows that the Supercell Parameter will be greatest in southern Mississippi. 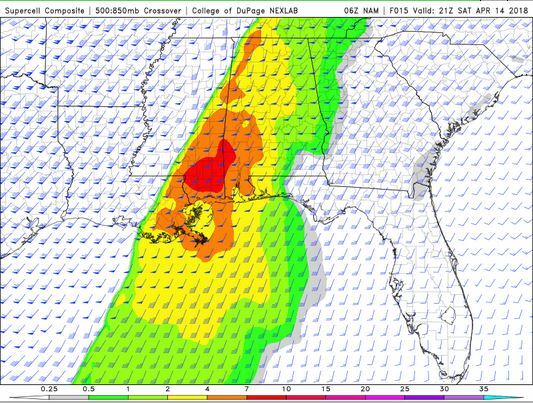 …as is the Significant Tornado Parameter. 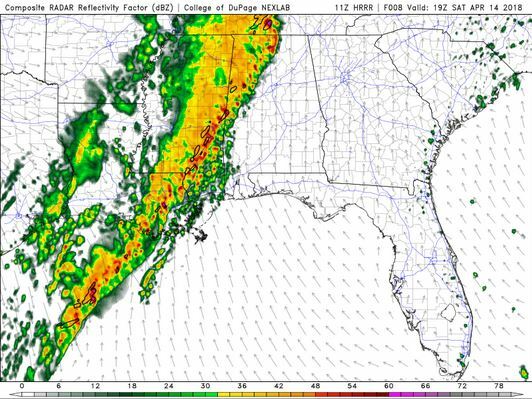 The HRRR Simulated Reflectivity chart shows that this system remain linear as it tracks east. 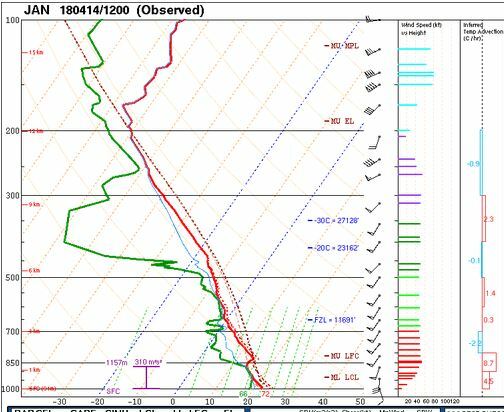 The 12Z upper air sounding from Jackson, MS, shows a lightly capped, but slightly energetic atmosphere. 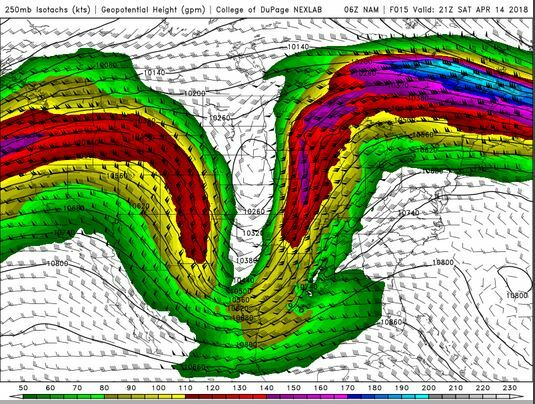 There was 1026 J/kg of Convective Available Potential Energy (CAPE) and -33 J/kg of Convective Inhibition (CINH). There was a small cap, and the 0-3 km average lapse rate was 6.6 C/km. The Lifted Condensation Level (LCL) was only 434 m. The Supercell Parameter was 9.8. 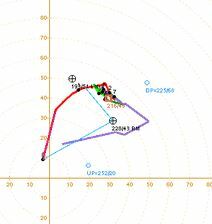 The hodograph from Norman, OK, shows 39 kts of low-level shear and 43 kts of deep-layer shear. Currently, the surface observations (from the SPC Mesoscale Analysis Map) show warm, humid, and cloudy conditions over the Enhanced Risk area. 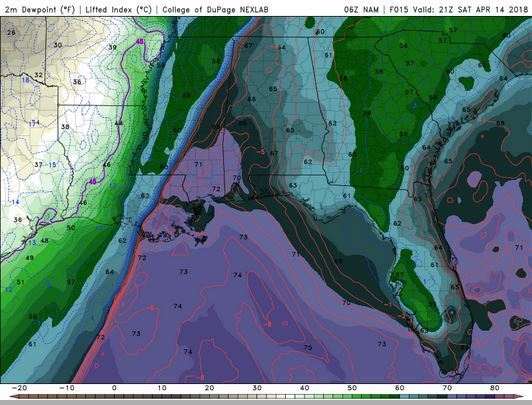 Surface winds from the southeast continue to advect warm, moist air into the region. 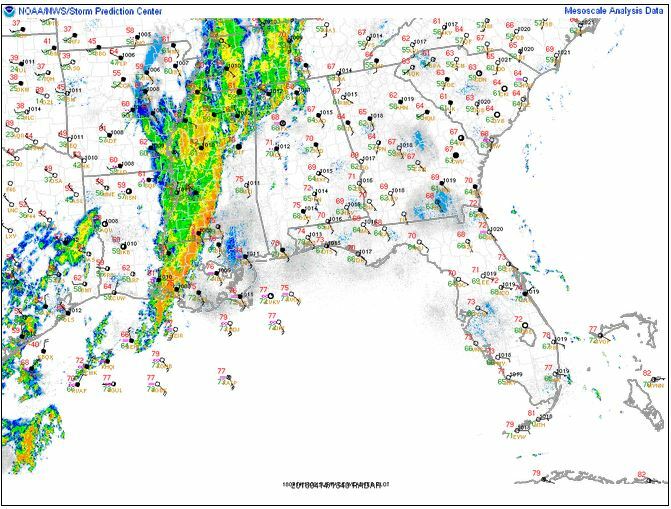 The Doppler RADAR overlay shows that yesterday’s storms have merged into a large squall line. Visible satellite imagery shows cloud streets advecting moisture into the south, just ahead of the approaching squall line. Overall, I think there is a strong severe threat today. 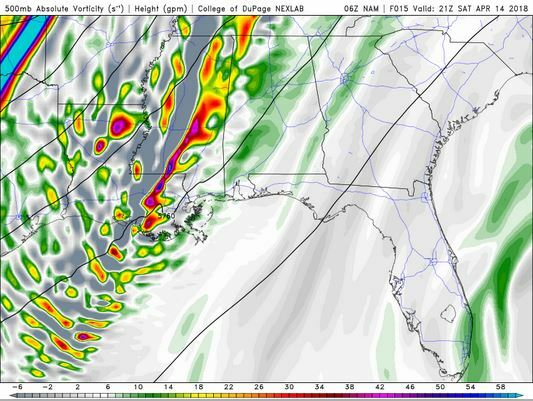 However, given the linear morphology of these storms and the chase terrain, it would be a tough chase. 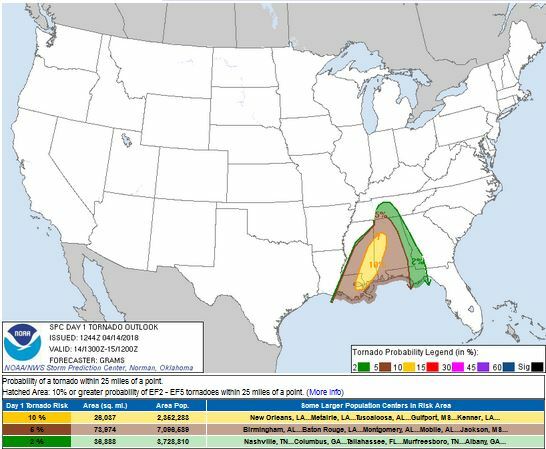 I would probably hang out somewhere south of I-20 in Mississippi, if I were chasing there. I may even go as far south as I-10. I would probably choose MS 98 and bounce from McComb to Hattiesburg. Thank you for reading my forecast. The upper air soundings and mesoscale analysis plots are from the <a href=”http://www.spc.noaa.gov/&#8221; target=”_blank”>Storm Prediction Center</a> website. The forecasted upper air soundings are from <a href=”http://www.twisterdata.com&#8221; target=”_blank”>TwisterData.com</a>. The surface observation and upper level charts are from <a href=”http://weather.unisys.com&#8221; target=”_blank”>Unisys Weather</a>. This blog is about my tales in storm chasing. My name is Seth Price and I am an instrumentation instructor at New Mexico Tech. My amateur radio call sign is N3MRA. 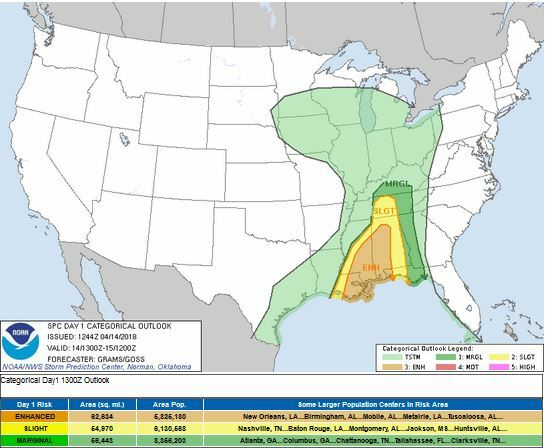 This entry was posted in Follow Up, Practicing Concepts, Predictions, Satellite Imagery, Severe Weather and tagged 10% tornado ring, Enhanced Risk, forecast, meteorology, severe weather, weather. Bookmark the permalink.